The long awaited iPhone 4GS finally was released in June 24th. 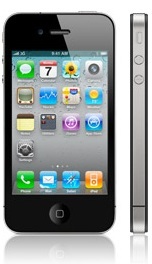 Steve Jobs has claimed that the new iPhone 4GS has more than a 100 new features to it. Nearly all the versions of the iPhone came in with a bang, but this one is surely on the go to be the most hi-tech gadget of all time. The iPhone 4GS has left no room for competitors to take over. Competitors like Nokia, Samsung and Motorola might be surprised and shocked seeing this new iPhone! It has so much to offer that it will turn its owner into Gadget Boy. To start with, the iPhone 4GS comes with a 1 GHz Apple A4 processor and iOS 4 (based on Mac OS), thus making it one of the best Smartphones of all time. We can keep on talking about the new added features, or we can simply jump to the ones that have caused the iPhone 4GS to start a buzz in town! For people who are wondering what iMovie is, it is a software program for editing and tagging videos to make it easier for the user to upload tagged videos on YouTube and similar websites. The iPhone 4GS comes with a 5 megapixel camera. Of course that’s something to ‘wow’ about! No previous version of the iPhone came with a flash, and this one comes with a LED flash. Isn’t that something you have always desired for in an iPhone? Plus, the phone is able to record videos in HD mode at 30 frames per second and at 720p resolution. Told you this iPhone has a lot of surprise you with! The Retina Display is not a special feature in the iPhone, but it is a property that definitely makes it superb. It refers to the pixel density of the screen. 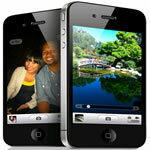 The iPhone 4GS offers 326 pixels per inch, which is nearly four times the display a standard LCD offers. To sum it up, you get 960 x 640 pixels as the resolution of the phone. Officials of Apple claim it to be a resolution that is more than what the human eye can perceive. So, basically if observed from a distance, the iPhone 4GS would appear like a high quality magazine to the human eye. That’s actually a big surprise! And don’t worry – Google will always be there. The new iPhone 4Gs offers both Bing and Google as default search engines. 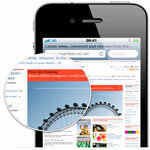 The surprising part is that despite the rivalry between Microsoft and Apple, Apple has used the search engine. Anyway, what matters is that users are getting two high profile search engines in one phone. Again a feature that can make you whoop big time! 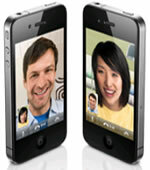 The iPhone 4GS offers a front camera that is to be used for video calling. Another bit of good news is that users can use the 5 megapixel camera at the back of the phone for video calling purposes too. All in all, the iPhone 4GS is a happening and a trend-setting phone! However, we don’t know yet which will be the next company following this trend. We doubt that’s not going to happen anywhere soon. Till then, users can proudly roam around with their iPhone 4GS. The information was very useful. The blog was very nice and interesting.Thank you very much. I already bought it and i am having fun with my iPhone at every moments. It is really awesome products from Apple!